Vkworld Mix Plus is a mid-range bezel-less phone released in August. After half a year, vkworld is going to launch its successor--vkworld Mix3. 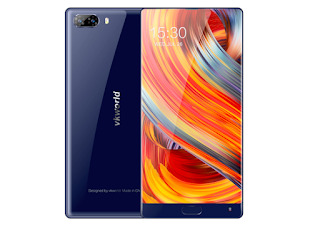 Actually,Mix3 is the former Mix2 we know a couple of months ago. Because of new technologies and features, the phone has some changes. So vkworld changed the name to Mix3. Mix3 will also feature a 5.99 inch 2160*1080 display with in-cell technology. The display will pack will sunlight mode, which can boost the brightness up to over 600nit in sunlight. So you can see the screen clearly. Also it will integrate with glove mode. The design is still dual glass on front and back with metal frame. And metal frame is also titanium, which has better strength and resistance. The glass is Corning Gorilla Glass 4 with anti-fingerprint coating. The dual camera is landed on the up-left corner. There is no fingerprint scanner on the back. It is located on the front panel. More preview on the specs reveals that the Mix3 will come with 6G RAM and 128G ROM, with a 2.5GHz octa-core processor and a 5000mAh battery. Vkworld Mix3 will be release in Q1 2018. And vkworld suggests that it will be the most affordable 6G RAM+128G ROM full-screen phone. More information about this device will be published in my subsequent posts. Watch out for the PRICE! 'the Mix3 will come with 6G RAM and 128G ROM alongside with 5000mah and many more, i knew its going to be awesome but the price is going to be heavy all the way..